A total of 54 young service technicians are being trained in this year’s John Deere Ag Tech, Parts Tech and Turf Tech advanced apprenticeship programmes, run in partnership with national training provider ProVQ – a increase of just over 60 per cent on the previous year’s intake. John Deere has also been listed for the second consecutive time in 2018 as one of the best 100 employers for school leavers in the UK, the only agricultural and turf machinery company to be so recognised. The AllAboutSchoolLeavers.co.uk’s Top 100 Employers for School & College Leavers rankings are based entirely on the opinions of apprentices and school leaver trainees from hundreds of UK organisations. John Deere’s and ProVQ’s successive annual awards were made in recognition of their programmes’ quality and the opportunities they present to young people working productively in the agricultural and turf sectors. “We have beaten some very strong competition from other household names, coming first for an engineering and manufacturing company and third overall in the Best Intermediate Apprenticeship Programme category in 2017,” said ProVQ managing director Julian Lloyd. 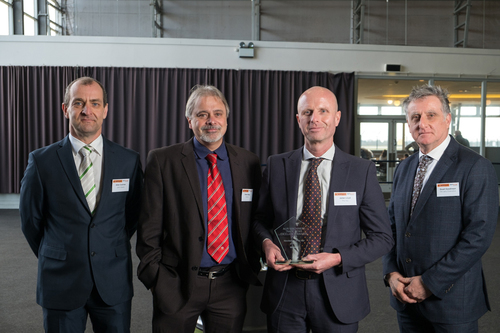 Even more recently John Deere and ProVQ have won the Manufacturer Excellence Award for Training in the 2018 Agri Machinery Trade News Awards. The award judges commented that “the enthusiasm and encouragement of the trainers shone out in the nominations” and that John Deere and ProVQ were “exemplars of what it takes to deliver world class training”. ProVQ’s Ag & Turf Tech apprentice assessor Simon Seago was specifically mentioned in one of the nominations from a John Deere dealer, who said: “Simon’s enthusiasm and encouragement transfers to our apprentices, enabling them to reach their potential during their initial industry training. John Deere’s three-year Ag Tech and Turf Tech and two-year Parts Tech apprenticeships lead to IMI Level 2 & 3 Diplomas in Landbased Engineering and Vehicle Parts Competence, and registration at LTA Intermediate level in the industry’s Landbased Training Accreditation scheme. In subsequent years qualified technicians undergo further education and adult training within the John Deere University programme, on a career path that can ultimately lead to the highest possible LTA Master Technician accreditation. Now in its 26th year, Ag Tech was the first such scheme to be introduced in the UK and won a National Training Award at the end of 1997, the only one ever made to an agricultural machinery apprenticeship programme. Since the first programme started in 1992, well over 700 apprentices have graduated through the three main schemes and are now working in the company’s nationwide dealer network.